This product is only available in our stores and via our free hotline. The Kettler e-bike E Blaze HT SUV (Hardtail, 27.5 inches) originates from the new e-mountain bike (E-MTB) series of Kettler. This sporty series is less designed for relaxed trip tours but rather for experience tours across the forest. The Hardtail diamond frame in combination with the Suntour suspension fork (120 mm spring-deflection!) and the 27.5 inches wide tyres stand symbolically for sportiness and agility. The high-quality equipment, which is perfect for rough terrain, is supported by the strong Bosch Performance CX motor, which offers a maximum torque of 75 Nm. That's how you can conquer steep ascents with a dynamic driving. The delivery of the Kettler e-bike E Blaze HT SUV (Hardtail, 27.5 inches) includes a 500 Wh battery. You do not have to fear any breakdown in the terrain: The Schwalbe Nobby tyres are equipped with a breakdown protection. 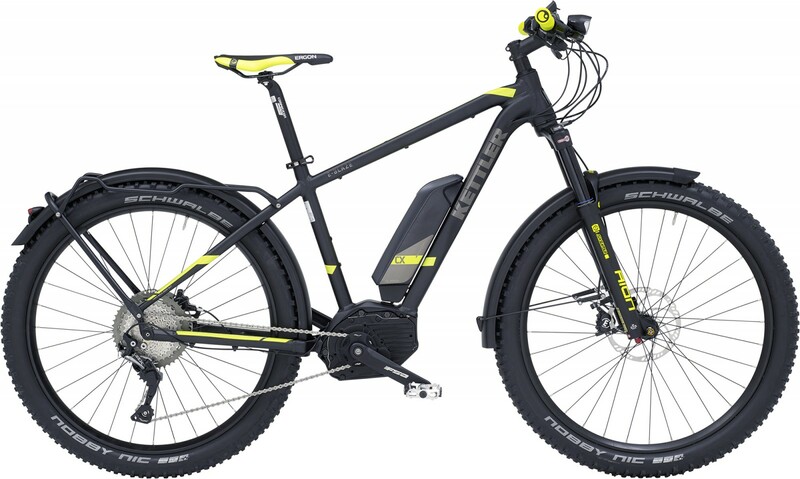 Kettler e-bike E Blaze HT SUV (Hardtail, 27.5 inches) add to comparison list.